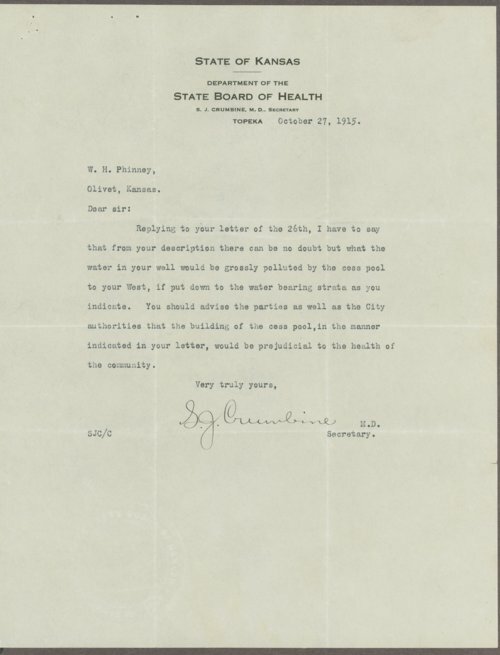 This correspondence is between William H. Phinney, a hardware store owner from Olivet, Kansas, and Samuel J. Crumbine, secretary of the Kansas State Board of Health, regarding a cesspool that threatened the community's water supply. In response, Dr. Crumbine warns against the danger of contamination but states that local ordinances govern the construction and use of cesspools. Collections - Manuscript - Miscellaneous - Misc. : Cre - Dau - Crumbine, S.J.